High up on the list of things to do before you die, below seeing the Northern Lights but above visiting Austria, is attempting The Bull Run. 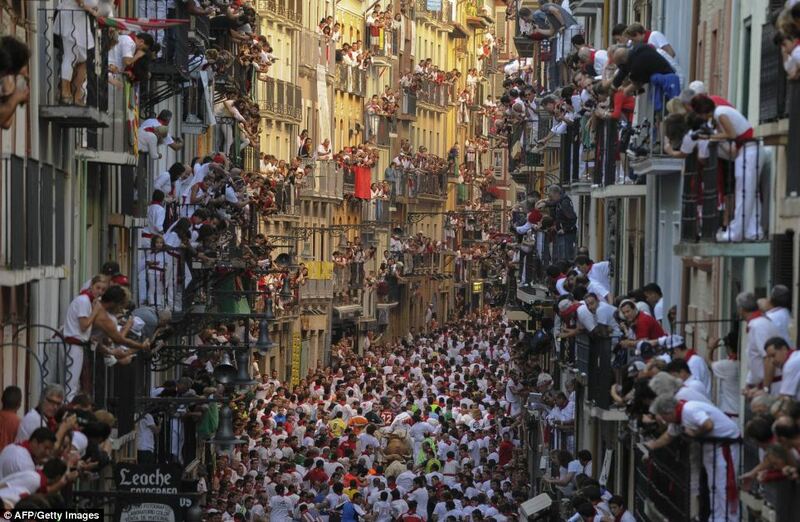 The fiesta of San Fermin, better known as The Running of the Bulls, takes place in Pamplona in the second week of July each year. 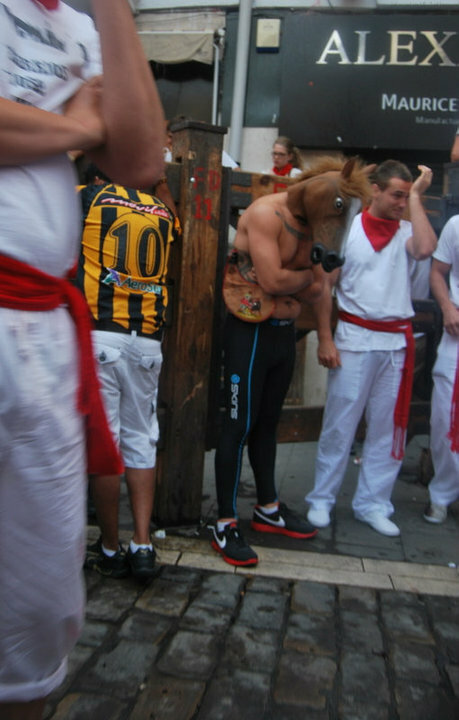 The tradition began in northern Spain in the early fourteenth century. Whilst transporting cattle to sell at the market, the men attempted to speed up the process by running alongside them, cajoling them with a mixture of fear and excitement. Over the years, this custom changed into competition, with the brave and reckless alike making the pilgrimage to Pamplona to answer their urge for adrenaline. This is where you join Tom, Justin and me, after a two week cycle from London through the heart of France and the peaks of the Pyrenees. We’re making our way to the start of the course, walking down the backstreets of Pamplona at 7:30am with a croissant in one hand and a coffee in the other. Except Justin, who is also balancing a carton of sangria in between his chest and forearm. Ambulances are preemptively parked down every side alley, stretchers sitting expectantly beside them. The other five thousand or so participants are meandering towards the start too, dressed in the compulsory white top and trousers, decorated with the customary red belt and bandana. Their outfits are also accessorised with splashes of blood red sangria. We gathered at the start of the L-shaped course with the other runners, exchanging stories and survival tactics. We quickly learnt that where we were standing, the turn of the L, was known as Dead Man’s Corner. As the bulls’ attempt to change direction at full speed they skid out, smash into the wall and squash anyone who’s ignorant or insane enough to stand there. 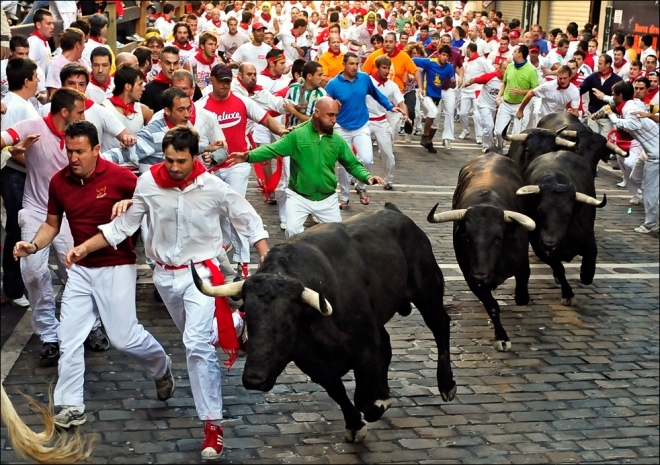 The beauty of the bull run is that you can make it as safe or dangerous as you desire. Justin was doing hamstring stretches at the apex of Dead Man’s Corner. Tom had barricaded himself in a doorway using a Chinese girl as a human shield. At two minutes to eight, a gong sounds and the mood switches. Simultaneously, we all realise that we’ve deliberately placed ourselves in a life-threatening situation. We start stretching and focusing, muscles tingling with fear and adrenaline. 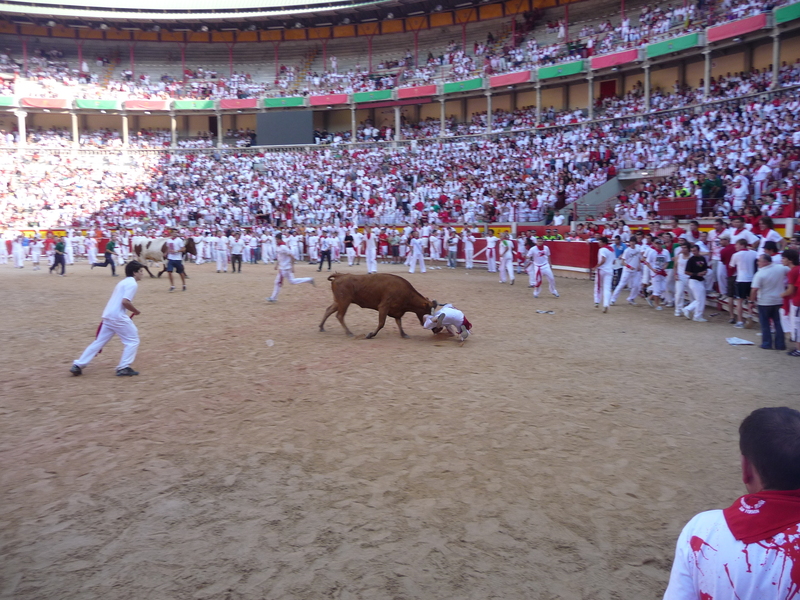 Then a second gong sounds to signal the bulls have started running. The narrow street descends into anarchy. Pure, unadulterated chaos underwritten by danger. Acute fear leads to survival mode. It’s every man for himself. We’re all sprinting for our lives, arms and elbows held either side of our faces to stop someone else elbowing us. We look like frantic, sprinting chickens, egged on by the impending arrival of stampeding bulls. The air is filled with shouts and screams and stomping footsteps. The only thing we’re thinking about is staying upright, with the occasional glance over our shoulders to check where the bulls are. They arrive quicker than expected, parting the red and white sea of people with beautiful brutality. For these few minutes, we are no longer at the top of the food chain. The crowd frantically scatters in front of them then regroups after they’ve passed. We chase them down the remaining stretch of street into the main arena where a packed crowd is waiting to applaud us. Inside the arena, we bask in the ecstasy of survival. I find Tom and we share the best hug of our lives. 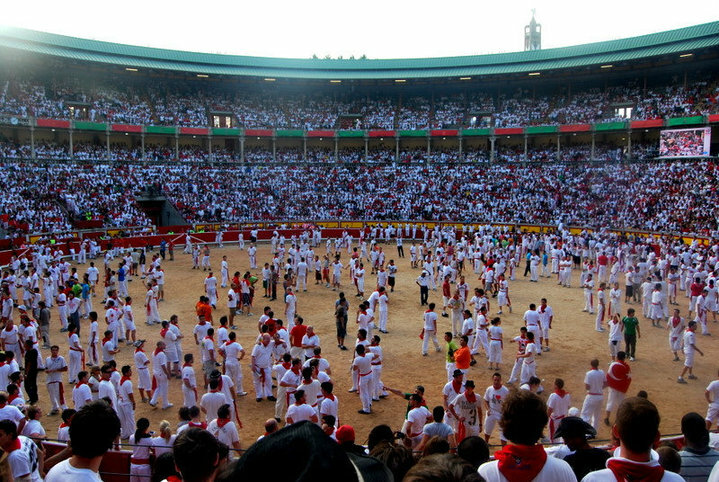 Over the course of an hour, six bulls are released into the arena one by one and the runners try to touch their horns for good luck. This felt curious to me, as it seemed to bring the majority of men who attempted it a pretty serious dose of bad luck. Outside, we found Justin being carried aloft a crowd of drunken bull-runners. His white attire was almost exclusively blood red. I felt a tremor in my stomach and assumed he’d been gored. Then, I saw his right arm attempting to pour a supersized carton of sangria in the general vicinity of his face but mainly succeeding in drenching the crowd beneath him, who continued to carry him like a decorated war hero. I still don’t know what he’d done to deserve it, but whatever it was, you don’t find excitement like that during the Northern Lights. Or in Austria.